The main theme of this tour is the railway line now used as a cycle track for recreation “the Carrilet”. It will take you from the beautiful volcanic region of la Garrotxa to the Mediterranean Sea. 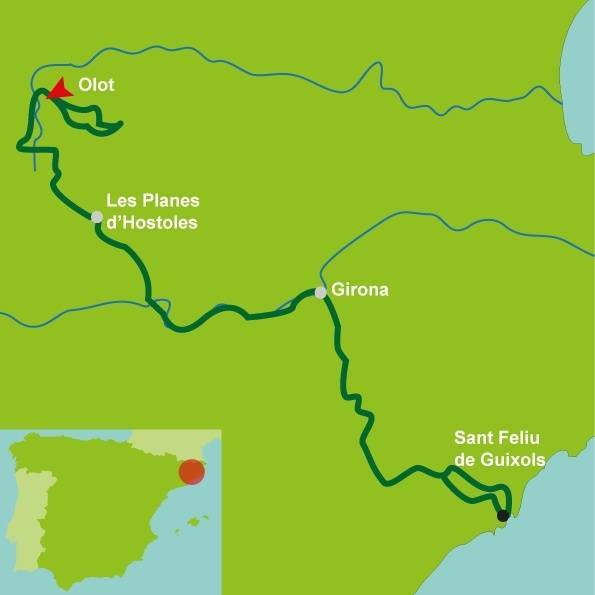 The entire tour takes place in the Catalonian region of Girona in the very north eastern tip of Spain. Three hotels have swimming pools and you finish with two nights by the beach on a lovely part of the Costa Brava. Mainly flat on safe cycle lanes, some downhill stretches. We recommend flying to Girona or Barcelona airport to reach the starting point of this cycling holiday. The Catalonia Greenways cycling holiday includes the daily transfer of luggage to the next hotel and local support if required.